Many tourists come to the cathedral city to get a picture of the Rhenish Frohnatur. They want to have fun and once Kölsch food and drink! We want to support you and give you tips and information about the top breweries. All impressions and opinions are of course subjective and can be felt differently by other people. But we try to recommend fair and correct! Due to lack of time, of course, we have not tested all breweries for a long time yet. We try very hard and will drink a lot of Kölsch and delicious food to inform you comprehensively! I promise. For us Deutzer there is of course an absolute highlight in the immediate vicinity: the former pub of the deceased host Hans Lommerzheim and his wife Annemie. The landlords operated this in the original form from 1959 to the end of 2004. 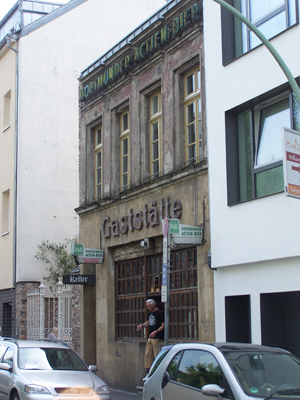 This legendary pub is simply unique in the Cologne hothouse culture. It is not rebuilt, not fake, just authentic and honest. Even after the takeover of the pub by the brewery Päffgen has renounced modern embellishments. That's why this little highlight is so authentic and good. Although the beer kegs are no longer on telephone directories, as legend has it ever happened before, but on normal beer mats, but from the outside, as well as from inside you have renounced unnecessary modern gadgets. Urig is the right word to describe this locality. From the outside, the pub looks a bit ugly, but if you look at the regular lines in front of the opening of the front door, then you can quickly assume that the shop is quite popular. And rightly so! Because the Kölsch is very tasty and especially in the summer in the beer garden, you can not get enough of it! The Köbes bring it quickly to the table, so you do not have to die of thirst. The service is friendly and fast and leaves nothing to be desired. A little joke in passing is always there. And best of all, it's very close to our Apartments Cologne ! 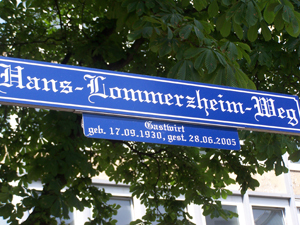 A path was named after Mr. Lommerzheim. In addition to the beer is the chop at Lommi the absolute hammer! You have to have seen and eaten such a thing! Huge and just delicious! With potato salad and onions and that for a Schnapper price of about 11 euros! You cant complain! Hearty Kölsche cuisine in all variations and variations is available here. If you order a sausage here, that's as big as two sausages in another restaurant! Just delicious and big! It tastes good, the portions are big and the prices are small. So an absolute blast in terms of value for money. For me Lommi is the best brewery in the cathedral city and you should definitely visit it once! And at Lommi you meet the best people: from the successful Cologne entrepreneur to the former FC professional, everything is there. It can even happen that one drinks there Kölsch and the Blackföös play a free surprise concert! The legend: It is said that Bill Clinton once wanted to enjoy this and wanted to stop there as part of his visit to Cologne. But Bill Clinton is not anybody and that's why the bar had to be secured by his bodyguards. Allegedly, these then called Mr. Lommerzheim and introduced themselves. They announced the visit and explained the host then the special security conditions. Among other things, the tavern should then be cleared. However, Lommi refuses this directly, pointing to his regulars, who are much more important to him than Mr Clinton! Perplexed, the security people took note of this and the American president picked another inn. Namely the malt mill! As we mentioned earlier, the malt mill became less famous because the then American president settled there. Mr. Clinton was turned down in the cult pub Lommi and therefore chose the malt mill. 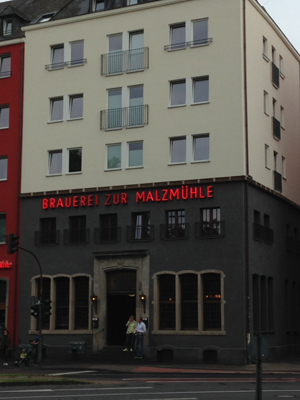 The malt mill is also quite rustic in its appearance and represents a typical, Cologne pub dar. It is located on the Heumarkt and therefore has a strategic location, which of course also brings a bit of passing customers. And that for over 150 years! Here is a piece of Cologne tradition and history to touch! Right in the old town of Cologne you can drink the so-called Mühlenkölsch. 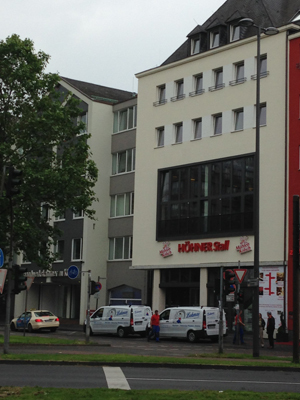 There is even a hotel of its own and the new "Höhnerstall" of the Cologne cult band the "Höhner". And now it's up to you! How does the Kölsch and the food taste? Short answer: Good! The beer is good to drink and the dishes are also tasty. Where the size of the portions in our view with the giant bratwurst at Lommi clearly can not keep up. The menu goes in the direction of "good bourgeois and home cooking" and is rated with good. The only point of criticism: due to the size and the mass of guests a Köbes ever lose the overview and it can take a while to be served again. In reviews on the internet you can also read that the food on the way to the table only lukewarm. This completes our overall impression a bit: the malt mill is good, but not perfect. Presumably, this is simply due to the high inflow and the associated mass processing. There is always something going on in the Brauhaus . Many Americans and other tourists visit this inn because it is simply very well known. In addition, many events take place here, which attract even more people there. A visit to the malt mill is always worthwhile and once you are in the cathedral city, then you can visit them in any case! Drink the top-fermented cult drink, which is filled approx. 18 million times in a Kölsch glass! There is hearty Kölsche cuisine ! Very cozy and quaint and in the middle of the city. Worth mentioning are the old wall paneling and the beer garden! The brewery Päffgen stands for quality and very good and tasty beer! Therefore the expectation is of course very high. Could the expectations be met? Do style and coziness match? At these points we can directly yell out a big YES. The beer is good and the store has just left a great quaint impression and even has a nice beer garden right in the middle of town! Now you might remember ... yes, exactly: Päffgen also runs the cult pub Lommi and of course high standards are set in points food. Can you keep up here as well? The answer is yes! Because the portions are not as big as in Lommi, although (according to Köbes) one ordered from the same butcher. But that can not be somehow. Ok, we still want to find a good selection of dishes and also rate them well with the grade. The prices are also ok. The beer garden: We would call this a bonbon of this brewery and even mention it as an insider tip for the next summer. Ample space and plenty of shade through trees and the surrounding houses. It's just perfect for a balmy summer evening! Abstract: Well worth a visit if you're in the area. This report is always updated! Ongoing, more breweries will be added and included in the coverage! But as already mentioned: unfortunately the time is short! We have too little of it. We are happy to invite you, if you also want to see your brewery here. Just send us an email.